Aerification didn't work - top dressing, and deep timing still didn't get you the results that you wanted? It's time to improve your greens with a drainage system. Our drainage will remove ground water and help water flow without the extensive cost and down time of rebuilding your green. Plus you can get the added benefits of firmer greens and lower soil temperatures in the summer which can result in better playing conditions. The Process wings by surveying the site. Once the contour and outlet direction is determined, the drainage designs established on 6' centers to provide consistent drainage throughout the green. The sod is then removed by hand in 7" x 15" strips and plywood is placed before trenching. The spoils are removed and the grade is checked before installing the 2" perforated pipe with micro-slits to depths of 15-16". 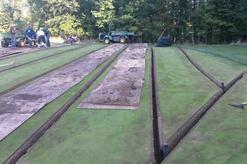 The pipe is then covered by a 6-2-2 greens mix that helps direct the water into the system. After the mix is tamped in place, the sod is returned to it's exact location to prevent shrinkage. The sod is tamped level and the green is cleaned with blowers. The green is immediately ready to roll, mow and play. The finished product is extraordinary and normally takes 1-2 days. Golf Preservations Inc has been involved with small and large scale projects that include; sod removal, re- contouring, greens drainage, and installation of new sod.